It takes 52% more touches to close a B2B sale. 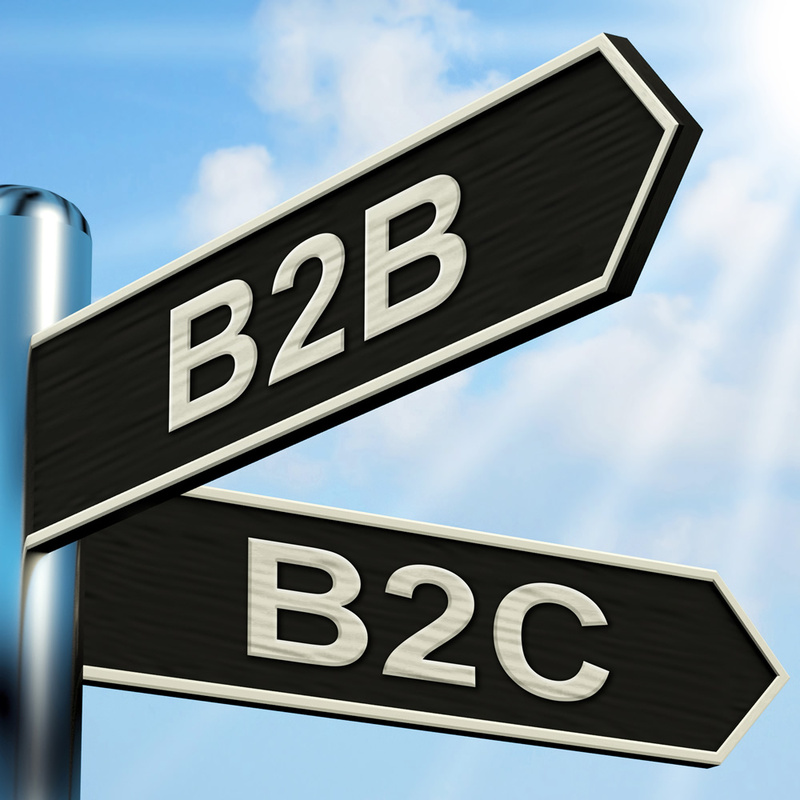 Understanding B2B vs B2C will ensure you use the right touches to get the best results. B2B marketing shouldn’t be lumped together with any B2C efforts your company is implementing. Continue reading this article to learn the differences between marketing to customers and businesses. Marketing is marketing, right? Not so much. There are some key differences that will make all of the difference when speaking to your B2B market. If you try to use B2C marketing strategies when you’re marketing to businesses, your results will be lacking. Since businesses do their best to streamline their buying process, you need to determine what is most important to the company. Every business wants to know how a product or service can save them time, money and other resources. Instead of focusing on benefits like you would when selling directly to customers, your strategies need to be focused mainly on what the features are. Show the features of your product or service and directly connect those features with how they are going to save the company money, time or other resources. As we pointed out earlier, every business wants to save or increase their resources. If your product or service can help them in these areas, you won’t have a problem with sales. If you’ve worked in B2C marketing before, it can be a difficult transition to go from one to the other. B2B is a much more of a long game than when you’re in the B2C marketing space. When you’re putting together your website design, be patient and take the time to know what type of website you need to gain respect. When you’re learning the best way to speak to your leads, take time to test what works. Each step in the process of B2B can take more time, but you shouldn’t let that deter you from making the big sales. As you learn more about digital marketing in the B2B space, you’ll see there is a lot of revenue available for your company. Your company will build relationships over time which will enable you to decrease the length of the sales cycle, but in the beginning, you will be working your patience a lot. While you will usually generate more money per sale with B2B sales, the cost of a sale is often higher than B2C. When you’re setting a price point for your product you need to think about how much money you need to profit off each sale to get a high enough return on your investment. Knowing your numbers is one of the most important things you can do for your business. If you aren’t sure how much marketing budget you have available or how much money you need to make on each sale, your business is heading for trouble. Having a clear understanding of why your B2B strategies need to be different than your B2C strategies will allow you to spend less time on ineffective marketing. Before you start marketing, make sure you have a clear understanding of how important it is to use the right strategies. While you are still selling to people, you are selling to people with a different mindset. Most of these people will have no emotional connection to the purchase of this product. The people responsible for purchasing your product or service are not likely to get a direct benefit from your service. You may be selling something necessary for their business like printer cartridges and while they are important, they are not going to move the emotion needle. When you are selling in the B2C space, you’re trained to push the pain point and show how your product or service is going to help. When you’re working with B2B sales, this strategy isn’t going to work. Focus on the features and price as well as customer service. When you’re a B2B company you should have plenty of call to actions throughout the site to talk to your sales professionals. The larger the sale, the more likely it is that people will want to talk to a live human to get their questions answered. Customer service should never be a back burner issue for your company. When you are a B2C company, your customers not only are likely to buy faster but they are likely to buy without speaking to a sales professional. The reason B2C sales can take place online so easily is because the sale price is usually lower and the customer is acting on emotion. Emotion evokes action but since your B2B customers are not acting on emotion, your sales professionals need to drive the facts home. Whether you choose to speak with your customers in person, by phone or through video, the higher the touch, the more likely it is that your sale will take place. Paying attention to detail on your website is a must since many of the people viewing your website are tech savvy. While this isn’t true for all B2B customers, it is the case for a larger number of them. You don’t want to lose credibility from misspelled words or other errors on your website. B2C companies should also pay attention to detail, but many B2C clients overlook the misspelling because the so-called professionalism of the site isn’t as important as when you’re working in the business space. Now that you know more about B2B vs B2C, you’ll be able to recognize a website that has great B2B content and one that doesn’t. Continue your education by reading our articles on how to create a mobile-friendly site for your B2B company. Next Is SEO Still Relevant?